Image theft, are your photos being misused!? 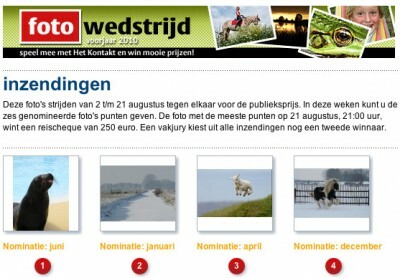 See the lamb photo in this screen shot from a recent Dutch publications online competition? Well I took it several years ago. And the contest was to win a prize valued at €250. The trouble is, I didn’t actually enter, someone else did, passing the image off as their own! You can find out if any of your images are being misused online with the link at the bottom of this article, but in the meantime read on to find out what happened in this particular instance with my photo. Very recently I was contacted by a person in The Netherlands who wanted to alert me to something very worrying. Someone over there had entered a photo competition on a Dutch publications website, with my photo and stood to win a prize of 250 Euros! It took a lot of emails and time trying to get to the bottom of this, not to mention work from some of my Twitter and Facebook followers sending emails on my behalf in Dutch (thank you to all who helped/offered). It eventually got sorted out with the very kind assistance of the lady who had informed me of this in the first place, when she actually called the editor of the publication and explained the situation for me, explained I had emailed several people at their end and also passed on my email address again saying I wanted some answers. The end result of which was the photo was withdrawn from the competition so at least removing the chances of the fraudulent entrant gaining from my work – but also resulted in voting being started again from scratch as a new image had to be inserted to replace mine, a big inconvenience for the honest entrants to the competition and those that had already voted. However, at the time of writing I have still not had any contact directly from the editor (or anyone) from the publication to apologies which I think is appalling. What alarmed me just as much as the fact the photo was entered by someone else though, was the fact it was entered more than once under different names (and had done well, winning the April section and now in the overall final)! You have to be worried when alarm bells do not ring in the editorials ears when the same image appears to be taken by more than one person! The fact that any time you put images online you are opening yourself up to them being ripped off! Of course, keeping them off the web would be the only real solution to all this but then why shouldn’t we be able to show others our work, and in many cases it is the web that we gain our contacts, clients etc from. To have no web presence could drastically reduce your chances of people knowing you exist and therefor hinder you making a name for yourself (unless you are already well established that is). At the very least putting a large enough watermark to reduce the chances off misuse will help, but of course is not guaranteed. And second, anyone who runs a photographic competition that allows digital entries should absolutely enforce the requirement for RAW files to be produced upon request. Or, failing that, a high resolution JPEG original to go some way to prove the photo was taken by the entrant and a low res one wasn’t just taken off an unsuspecting photgraphers website. So be careful out there. Thankfully on more than one occasion, including this one, someone has recognised the photo as mine and contacted me to warn me. Tineye to the (partial) rescue!